Chain restaurant Wagamama has teamed up with Avant Garde Vegan – aka – Gaz Oakley – to launch a new vegan dish. The Avant-Gard’n will launch in London‘s ‘Noodle Lab’ outlet as well as the Cardiff branch (Oakley’s hometown) on October 15. The bowl features BBQ glazed seitan, caramelized king oyster mushrooms and asparagus, sticky rice, edamame, spring onion, and carrot. It is topped with Oakley’s vegan egg made with miso-infused coconut and Sriracha Mayo. 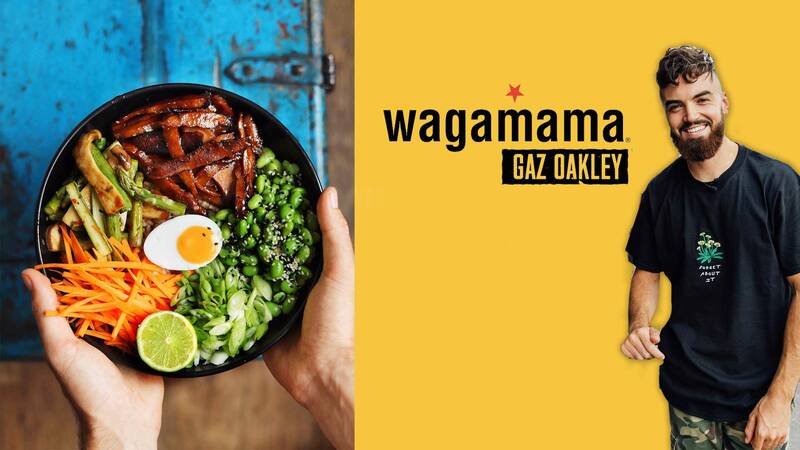 “I’ve been a fan of Wagamama since I was around eight-years-old when my dad brought home a Wagamama cookbook, which also included a recipe video DVD featuring the Executive Chef Steve Mangleshot,” Oakley told Plant Based News. “I really became obsessed with Wagamama from then on! “The dish we have created is mind-blowing and encapsulates my style and ethos,” he added. “I really believe this dish will spark non-vegan interest in vegan food, having the meaty element in the seitan and of course including my vegan egg – but most importantly it tastes phenomenal.